So, this morning – I was unable to get myself out of bed to go and run. I think knowing it is around 30-40 degrees in the morning and 60ish after work is not helping. I see a pleasant evening run in my near future. However, since I did not run – this post must be about something else right? INDEED! Yesterday, while reviewing interesting things on the Interwebs, I ran across a NY Times article by Christopher McDougall published the day before. It was, as one might expect when he is mentioned, about running. Specifically (again, no surprise) about something that could help barefoot/minimalist runners. He had found an Essay written in 1908 titled ““W. G. George’s Own Account From the 100-Up Exercise.” Walter Goodall George was born in 1858 – so there were obviously no Nike’s, Fuel Belts, VFFs or any of the other wonderful things we are used to having as modern runners. With training himself – he ran his first race and won in 4:29 (with a 45-yard handicap given to him as he was a “noob.”) At the age of 21, he won the mile (again in 4:29) and the four mile in the 1879 Amateur Championships. Ho won the mile and four mile the following year at the Amateur Athletic Association, and set a new amateur world record in august with a 4:23.20. 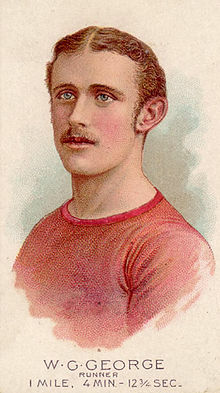 After many more records and wins – he went “Pro” in 1885,and challenged the reigning champion – William Cummings on the 31st of August in 1885 – Beating him. In the rematch the following year, George won again – setting the world record of 4:12.75 – he held the record for 30 years. I mention this background – so that we can see that W.G. George was not just a good runner – but the greatest runner of his time for the mile (and amazing in the 4 mile and 10 mile as well.) So – what was this 100-up that he used as a huge part of us original training? They also included a video – for those of us that might not grasp it just from a description in the article. The actually “100-up” seems to start around 1:30ish. Doing that 100 times? WOW!!! I am definitely going to look into this one! IT should certainly be a great workout for my calves, and will help me continue to work on what has been the weakest part of my body! naturallyengineered.com points out that “anything McDougall suggests will get an insane amount of hype” – so you will see ALOT of people claiming it is the ultimate answer. I will let you know how it works out for me. As I recall, he would run in place lifting his knees as high as possible and repeat this 100 times, at least once a day. W.G. George actually wrote a book on it. But good luck finding it! Editted at 12:42 – I have had more hits on this post today – than any other I have written has received in one day. To those stopping by – Are you going to try this exercise? What are your thoughts on it? I would love to hear them! ‹ A wonderful evening run, and a nice way to start the day. We all should find something we love and do that. I used to run up to the age of 36. Then I stopped. I’m 56 and went out today and instead of walking I ran just like George taught. I’m home now reading more about the story behind McDougall and I will be doing the 100 up exercise to build up my legs to run through the winter. For the first time in 20 years I’ve re-connected with something that I loved doing and thought my three crushed disks and sedentary life would never have allowed me to run again––but I did it and feel awesome. That is AWESOME Michael! I think getting back something you love, beats finding something new! How is your back feeling now that it is the “Day after”? McDougall’s Born to run is a good book – It is what turned me on to the idea of running in VFFs (I have to admit to not being all that interested in running completely bare-foot.. to much dog poop and glass in these parts.) I started doing the 100-ups, but wasn’t including the hand motion like McDougall did in the video, so I will be adding that in today.